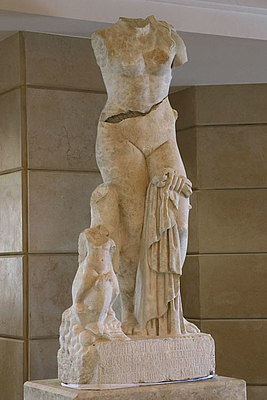 The ancient Greek goddess is associated with love, beauty, pleasure, and procreation. The larger than life marble statue has a five-line Greek inscription on the plinth. According to this, the figure was donated by a local priest named Demetrios, stepson of Asklepiodoros, together with the base, the altar and the niche. The inscription also indicates the unusually exact date of dedication, around 20 March 154 AD. A block or slab under a statue, column or architectural element.